This interview is the first of two stories from transit agencies that are currently using hydrogen buses in their fleets. Here, we provide you with real-world insight into how these buses are servicing communities, and helping cities meet their zero-emissions goals. Are you ready to bring zero-emission buses into your transit fleet? 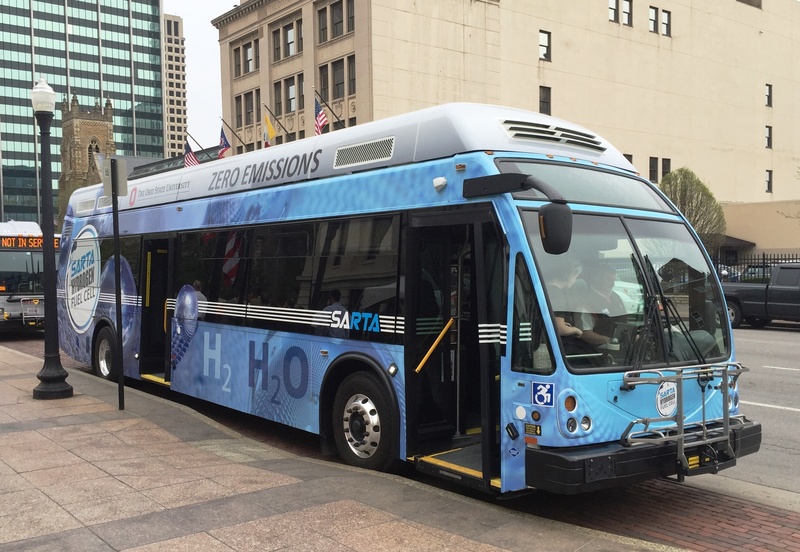 As more and more transit agencies adopt hydrogen bus technology, we are approaching a tipping point where it has the potential to become mainstream. Early adopters of fuel cell buses in the US, Europe, and China have paved the way for other agencies to make the transition to hydrogen-powered fleets. To talk about this transition, we sat down with Kirt Conrad, the CEO at Stark Area Regional Transit Authority in Ohio who are putting 10 fuel cell electric buses on the road in 2017. Kirt shared his experience in implementing FCEBs into SARTA’s transit fleet, as well as his outlook on the future of hydrogen buses in our communities. Who was your inspiration for implementing a zero emission program in your community? The two big transit agencies that provided us with guidance are Sunline and AC Transit. AC Transit has been using fuel cell buses since the early 2000s, and Sunline since 2010. They are at the leading edge of this technology shift and have established best practices and protocols that many transit agencies are emulating. SARTA has a commitment to implement ten FCEBs by the end of 2017. What were your expectations regarding this implementation? CNG powered buses have been a part of the SARTA fleet for quite some time now. Once you are used to using a gas, like CNG, the transition to hydrogen is really easy. They have similar behaviors as they are both gases. So our team was already familiar with compressed gas and the refueling protocols, making the change to hydrogen predictable and efficient. In addition, zero emissions vehicles are where the industry needs to go. We wanted to do our part in commercializing the technology and demonstrating leadership. Now that you have the first two buses operating in your fleet, what challenges have you overcome? We had to make sure that all the components work together, but most of the time this was beyond our control. Integrators need to speak with the system people, the fuel cell maker, and the bus manufacturers. The buses are complex machines and getting them installed as part of our fleet is a task that needs input from those who have implemented such systems before. One issue that we are dealing with is our allocated space for the fueling station. Our engineers, it seems, have made the space too tight. A recommendation I would make to a transit operator who is considering this technology is to make the proper space allocations for the necessary infrastructure. We know that fuel cell technology is a real and long-term solution. So let’s design the systems with that in mind. What were the impacts on your community? What were you measuring, and were there any surprises? The biggest thing is how well the buses have been received by the general public. Ohio is a pretty conservative state and a lot of people are very pleased that we are part of this leading edge technology, and especially that it’s happening in our community. One of my biggest surprises is that everyone comments on how quiet the buses are when in motion. Along with Ohio State University, we have launched the Mid-West Center for Excellence in Renewable Energy. We operate one of our fuel cell buses on the campus and part of that demonstration is the data gathering. In addition, the demonstration provides a learning experience to the students about zero-emission transportation. The relationship with OSU is very important to us. Are the buses meeting your availability expectations? Getting any new system put in place does present its challenges. Fuel cell buses are no different than any others. As transit authorities, we may believe that all buses are mass-produced, but in reality they are built one at a time. We need to remember that they are complex machines with many interconnected systems. So in our experience, getting familiar with the fuel cell buses has been no different than getting familiar with buses powered by other fuels. What advice would you give transit CEOs or General Managers that are considering hydrogen fuel cell technology? The technology for FCEB is pretty solid and agencies should not be afraid of it. In addition, the manufacturers have clearly demonstrated the technology is viable and commercially applicable. If you can design your refueling stations to be accessible by the general public, you will then create the scale you need for your own infrastructure. Moving forward, the supply for hydrogen refueling will make it more appealing to the demand side of the equation. Transit operators, and the public sector in general, need to be leading the way for the adoption of alternate fuels by sharing the fueling infrastructure. To implement the system, look to transit agencies that have already adopted FCEB into their fleets. They will have established best practices that you can reference as you build your own procedures and systems. Have your team visit those facilities so they become familiar with how these agencies are using the technology. What does the future of fuel cell buses look like? The commitments are being made by so many organizations, from manufacturers to politicians and community leaders. Hydrogen technology is real and the future demands that we adopt zero emission solutions. The increased interest is also encouraging agencies like ours to purchase fuel cell buses. This is happening in many different places, and is driving the initial fuel cell bus costs down. I see this increase in demand making the FCEBs’ purchasing costs on par with diesel buses in the near future. Once we reach that point there will be a lot more people getting into FCEBs. Also, when you see major corporations, like Toyota, staking their future on this technology, transit agencies shouldn’t feel like they are “the early adopters of an unproven technology”. Instead transit agencies, making these first steps, will be way ahead of the curve and their communities will truly benefit. There’s no doubt that hydrogen powered fuel cells are going to be a big part of our zero emission future. As a result of using hydrogen bus technology for the past seven years, Kirt Conrad is well versed in its implementation, evolution, and success. The fuel cell bus revolution is happening now, and will only continue to grow into the future. Kirt sees this technology as a long-term solution, so transit agencies should take practical measures now to learn about systems and best practices. Lean upon the experience of Kirt and others like him as you make the move to zero-emission transit. If you enjoyed this interview and want to share your thoughts, feel free to comment below. Follow #hydrogenbus on Twitter for more conversation on this topic. For more information, read the following report on hydrogen fueling solutions for North American transit operators. Download our free white paper to learn about hydrogen refueling infrastructure for North American transit operators.